What jumps out at me first are all the events related to the presence in Houston that week of the annual meeting of the American Chemical Society, which was clearly a big deal. It was the Society’s 117th meeting, it’s second in Texas and the first in Houston. 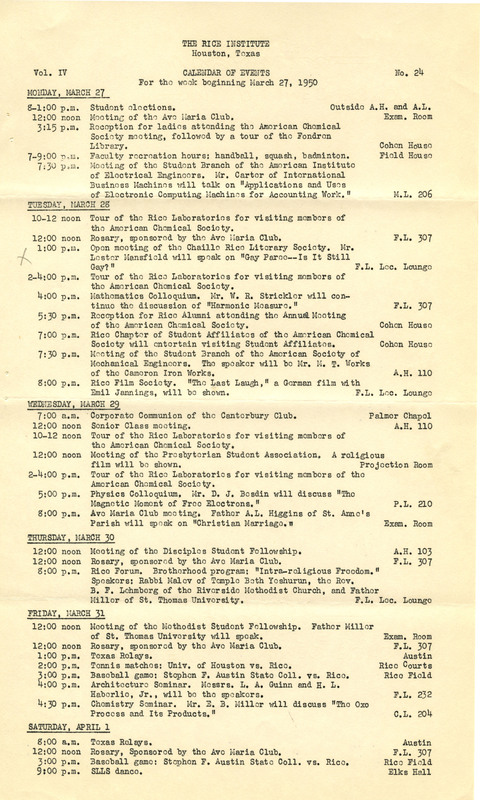 The campus was mobilized for receptions and other quasi-social events, including tours of the labs and the library. Quite a bit of the heavy lifting and behind-the-scenes labor was provided by the Rice student affiliate chapter of the ACS. Five Rice faculty members, including W.O. Milligan, Holmes Richter, and the then-Dean, Harry Weiser, gave papers at the conference, as did several alumni of Rice’s graduate program in chemistry. (Weiser came to Rice in 1915 and became Dean of the Institute in addition to Chairman of the Chemistry Department in 1933. He would be dead by fall. He was succeeded as Dean by his colleague Holmes Richter. Weiser was, I believe a colloid chemist and Richter was the author of a heavily used organic chemistry textbook.) Another interesting note about this meeting: one of the Society’s award recipients this year was Dr. Kenneth Pitzer, then on leave from Berkeley to serve as Director of Research for the Atomic Energy Commission. Apart from the ACS meeting, things look to have been busy but routine. I wondered at first why the Ave Maria Club skipped its noon rosary on Wednesday, but then realized it was because they had a meeting that evening. And although I’m inherently suspicious of “brotherhood,” I was kind of interested in the Thursday talk by a panel of religious leaders on that topic. It didn’t get any coverage by the Thresher, though, beyond a story that it was about to happen. Likewise, the Thresher wasn’t really putting a lot of resources into sports coverage that year, so I don’t know whether Rice won its tennis match with U of H. The baseball team did win both of its games with the Lumberjacks of Stephen F. Austin, the second a “wild slugfest” according to the paper. This was a bright spot in a fairly miserable 9-16 season.